Update 27 – Now you can destroy avatars! 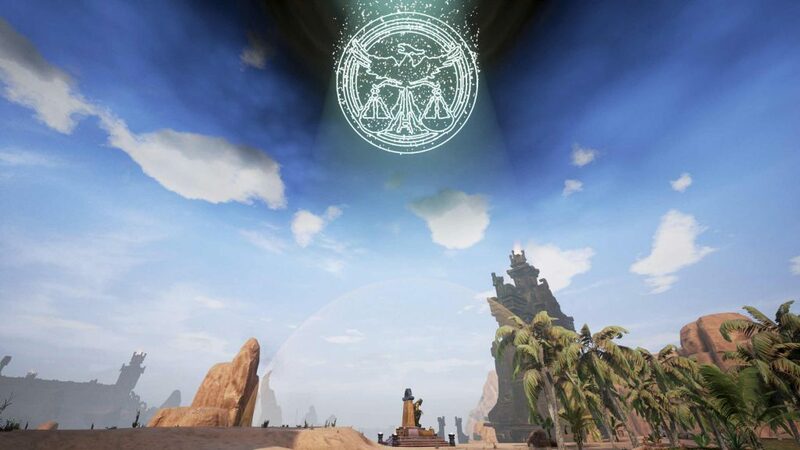 In Conan Exiles the god avatars have been the ultimate force of destruction, capable of reducing a city to rubble within just a few seconds. When seeing one on the horizon there was usually only one thing you could do: run away. With this update all of that is about to change. God avatars are made vulnerable and can be destroyed in the blink of an eye. In addition to this we’re also adding explosive glass orbs, crenelated walls and siege cauldrons, elevators, and a drawbridge that we think players will like. The first major change that are happening to the god avatar is the reduction of their offensive power. Before they could simply walk, fly or slither their way over any building and tear it all down in a few seconds. We have significantly toned down the amount of damage they will do by simply existing, and if you want to use an avatar to destroy someone’s buildings you will need to use their special attacks to do so. Secondly we’re making avatars more vulnerable. Projectiles like the explosive glass orbs (more on those later), arrows and crossbow bolts, and siege boulders will now damage an avatar. Whenever an avatar takes damage a certain amount of its remaining summoning time will be removed. In practice this means that the more damage you do to an avatar the quicker it will disappear, so load up the trebuchets and bring those giants down! Once all of this is in place you can activate two protective domes that will remain for approximately 36 hours. The outer, larger dome, is a barrier that will do damage against enemy avatars once they cross its threshold. The inner, smaller dome, shields whatever it surrounds from all kinds of projectile attacks, but players will still be able to walk through the. If an avatar touches this dome it will disappear immediately. Players familiar with the Conan stories might nod their head knowingly at the special glass orbs we’re introducing in this update. These grenade like objects can produce a variety of different effects and can be an effective weapon if need be. It’s a small first step on the road to the full sorcery system and we think you’ll like what you can do with them. You’ll be able to craft four types of throwable orbs containing either grease, fire, gas or water. Your first step is capturing an alchemist thrall, which you can find among the larger camps and cities in the Exiled Lands. 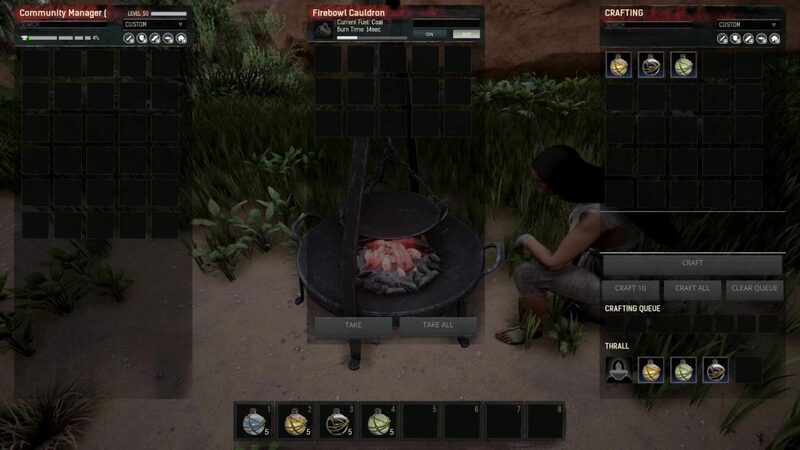 Breaking these thralls and putting them to work in your Firebowl Cauldron will give you access to the recipes you need. Water orbs are the easiest to make, requiring a water filled glass flask (flasks can be made in furnaces with a mold), and some ichor. The water orbs will be the basis for all the other orbs. Water orbs will extinguish fires left behind by a fire orb. Fire orbs, as the name implies, explode on impact, creating a fire that will burn for a while. To make a fire orb you need to hunt down exploding imps, also located in the southern part of the desert. They’re rare and a bit tricky to take down, as they tend to explode when they come near humans. If you manage to slay one you need to harvest their explosive gland in order to craft a fire orb. Grease orbs are made with tar, which is a byproduct of tanning hide into leather. These orbs will leave an area covered in grease when they break, making it difficult to walk over. The grease can also be ignited with the fire orbs, creating a great wall of fire. Gas orbs require a new item, Puffer Mushrooms. These can be found in the south of the desert, but are very rare. Gas orbs work much like the gas traps, covering a certain area with poison that will damage people who walk through it. Throw a fire orb into the gas and it will cause additional explosions in the area. We’re also expanding the ways you can defend yourself against attackers in this update to Conan Exiles. The crenelated walls acts as a defense against eventual climbers, a system that will be implemented in about 2-3 weeks. Attaching the new siege cauldrons to the crenelated walls will let you pour boiling oil over anyone trying to scale your castle walls. 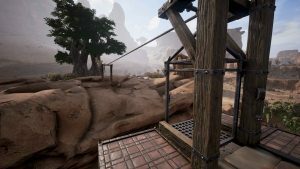 The new horizontal and vertical elevators will allow you and your clan to easily move things back and forth across gaps or up and down towers and shafts. Finally, the new drawbridge can let your clan lock up the door behind you after you’ve left to go on a raid. With this update we will also be implementing a ping limiter into the game. It will be turned off by default for private servers, but can easily be turned on in the server settings. For official servers they will be switched on when this update goes live. The ping limiter will obviously see tweaks and changes throughout the Early Access period. Finally some of the PvP Blitz servers are getting updated with PvP raid timers, only allowing players to raid each other between 5pm (17.00) to 11.59pm (23.59) on weekdays, and 10am (10.00) to 11.59pm (23.59) on weekends. These servers used to have avatars switched off, but with the new avatar defense features now being implemented we wanted to re-purpose them to be servers with limited times for player versus player combat. We hope you enjoy the changes we’ve made and the features we’ve implemented in Conan Exiles with this update. As always, please get in touch if you have constructive feedback and criticism. 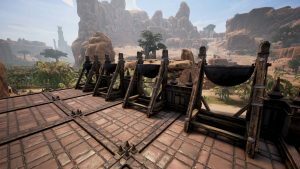 We want to make Conan Exiles the best survival game it can be, and we can only do that thanks to you, the players.